Almostpighunter wins February Backed BOM contest!!! Congratulations to "Almostpighunter" from Las Vegas, NV for winning February Backed BOM Contest! Here's what Michael says about his BOM contribution, entry and win: Well, here's my first attempt with sinew and I have to say that I aim to be doing a lot more. The bow is Osage Orange backed with sinew and baby Burmese Python. 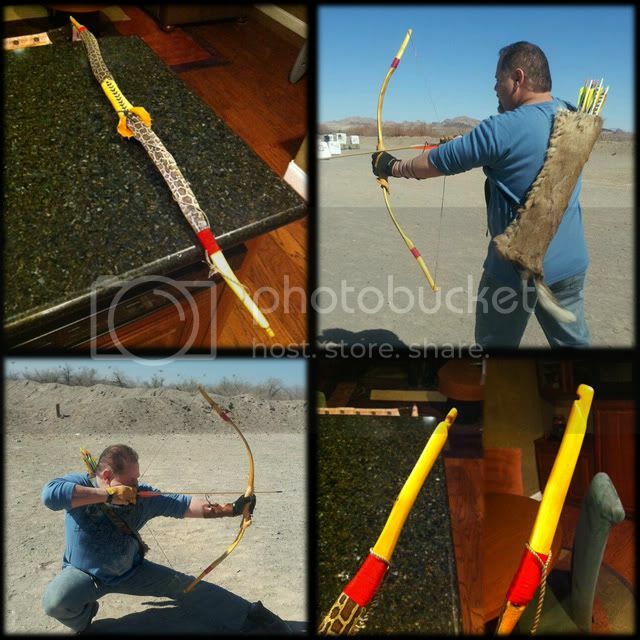 At the moment it is shoot off the hand, with the handle wrapped with buckskin. Shooting right around the 155-160fps marker at 55#@28". The bow is 54"T2T and 52"N2N, kinda a mollegabet hybrid with static tips with a very slight natural recurve, which is good because it did take some set (or as I have heard some other bowyers say: "It settled in a little bit"). I absolutely love the smoothness of this bow and am feeling really good about the world of sinew after this first attempt/success. Re: Almostpighunter wins February Backed BOM contest!!! Congrats on another winner Michael!! Wow Cam! You outdid yourself. Thank you mucho!! Congadulations almost... That is a swell looking weapon. A well deserved win. Beautiful bow!!! The contrast between the different materials is absolutely striking, a job well done and certainly a well deserved win... congrats. Just realized I put my "Thank you" in the other thread... so, to everyone on this forum, thank you very much. I am so humbled, honored and inspired that my first attempt at sinew backing would be so well received. You guys are the best! Page created in 0.769 seconds with 26 queries.